The 2012 United States presidential election in South Carolina took place on November 6, 2012, as part of the 2012 General Election in which all 50 states plus The District of Columbia participated. 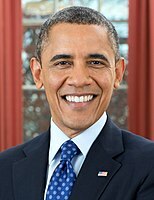 South Carolina voters chose 9 electors to represent them in the Electoral College via a popular vote pitting incumbent Democratic President Barack Obama and his running mate, Vice President Joe Biden, against Republican challenger and former Massachusetts Governor Mitt Romney and his running mate, Congressman Paul Ryan. Romney defeated Obama in the state by 54.56% to 44.09%, a margin of 10.47%. President Obama was unopposed in the Democratic primary and easily won with more than 99% of the vote. The Democratic election was held on January 28, 2012, one week after the Republican election. The Republican primary was held on January 21, 2012. During the primary election campaign, the candidates ran on a platform of government reform in Washington. Domestic, foreign and economic policy emerged as the main themes in the election campaign following the onset of the 2008 economic crisis, as well as policies implemented by the Obama administration. This included the Patient Protection and Affordable Care Act, termed "Obamacare" by its opponents, as well as government spending as a whole. The primary has become one of several key early state nominating contests in the process of choosing the nominee of the Republican Party for the election for President of the United States. It has historically been more important for the Republican Party than for the Democratic Party; from its inception in 1980, until the nomination of Mitt Romney in 2012, the winner of the Republican presidential primary had gone on to win the nomination. As of 2012, the primary has cemented its place as the "First in the South" primary for both parties. Newt Gingrich was declared the winner of the race as soon as polls closed, however, Mitt Romney went on to win the nomination. The 2012 South Carolina Republican primary was tentatively scheduled to occur on February 28, 2012, much later than the date in 2008, which almost immediately followed the beginning of the year in January 2008. On September 29, 2011, the entire schedule of caucuses and primaries was disrupted, however, when it was announced that the Republican Party of Florida had decided to move up its primary to January 31, in an attempt to bring attention to its own primary contest, and attract the presidential candidates to visit the state. Because of the move, the Republican National Committee decided to strip Florida of half of its delegates. Also as a result, the South Carolina Republican Party, along with Iowa, New Hampshire and Nevada then sought to move their primaries and caucuses back into early January. All but Nevada, who agreed to follow Florida, confirmed their caucus and primary dates to take place throughout January, with South Carolina deciding to hold their contest on January 21, 2012. It is an open primary. Nine candidates appeared on the presidential primary ballot. South Carolina had only 25 delegates up for grabs because it moved its primary to January 21. Eleven delegates were awarded for the statewide winner, Newt Gingrich, and two additional delegates were awarded to the winner of each of the seven congressional districts. Six districts were won by Gingrich, and one by Romney, giving Gingrich twelve additional delegates and Romney two delegates. Official results with 100% (2,117 of 2,117) precincts reporting. There were 2,804,231 registered voters, for a turnout of 21.60%. Technically the voters of South Carolina cast their ballots for electors: representatives to the Electoral College. South Carolina is allocated 9 electors because it has 7 congressional districts and 2 senators. All candidates who appear on the ballot or qualify to receive write-in votes must submit a list of 9 electors, who pledge to vote for their candidate and his or her running mate. Whoever wins the majority of votes in the state is awarded all 9 electoral votes. Their chosen electors then vote for president and vice president. Although electors are pledged to their candidate and running mate, they are not obligated to vote for them. An elector who votes for someone other than his or her candidate is known as a faithless elector. The electors of each state and the District of Columbia met on December 19, 2016, to cast their votes for president and vice president. The Electoral College itself never meets as one body. Instead the electors from each state and the District of Columbia met in their respective capitols. The following were the members of the Electoral College from the state. All 9 were pledged for Romney/Ryan. ^ "Dave Leip's Atlas of U.S. Presidential Elections". Retrieved December 7, 2012. ^ "GOP bellwether South Carolina shows a tangled race: Pg 1". Retrieved January 20, 2008. ^ "First in the South". Fox News. Archived from the original on January 22, 2008. Retrieved January 20, 2008. ^ Falcone, Michael (September 2, 2011). "South Carolina GOP Officials Hope To Strike Deal With Florida To 'Calm' 2012 Primary Waters". ABC News. Retrieved November 4, 2011. 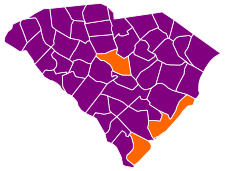 ^ "South Carolina Primary Results". The New York Times. Retrieved November 4, 2011. ^ Taylor, Steven (September 29, 2011). "Florida Moves its Primary". Outside the Beltway. Retrieved November 3, 2011. ^ a b c Jacobs, Jennifer (October 25, 2011). "GOP chairman: Florida will be penalized, and 2012 race is now set". Des Moines Register. Retrieved November 3, 2011. ^ Nir, David (October 24, 2011). "Nevada Republicans cave, move caucuses to Feb. 4". Daily Kos. Retrieved November 3, 2011. ^ Richard E. Berg-Andersson. "South Carolina Republican". The Green Papers. Retrieved January 14, 2012. ^ Whitmire, C. "2012 Republican Presidential Primary Candidates". South Carolina State Election Commission. Archived from the original on August 22, 2012. Retrieved January 11, 2012. ^ Kleefeld, Eric (January 4, 2012). "South Carolina GOP Chairman: 'Anyone Can Win' In Our Primary". Talking Points Memo. Archived from the original on January 11, 2012. Retrieved January 11, 2012. ^ a b "South Carolina Primary". South Carolina State Election Commission. February 3, 2012. Retrieved February 22, 2012. This page was last edited on 16 April 2019, at 03:23 (UTC).